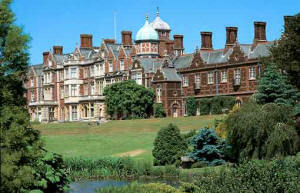 Sandringham lies in north-west Norfolk approximately 8 miles north of King's Lynn. Sandringham House belongs to the Royal Family and is their favourite country retreat. The hall was purchased in 1862 by Queen Victoria and was then redesigned for the Prince of Wales (Edward VII). The red-brick house was completed in 1870. On the instructions of King Edward VII all of the clocks at Sandringham were set half an hour ahead of Greenwich Mean Time in order to allow more daylight for hunting. This custom ended with the death of George V. George V famously said: 'Dear old Sandringham, the place I love better than anywhere else in the world'. One of the strangest visitors to Wolferton Station was the Russian monk Rasputin who once travelled here to demand an audience with the king. Apparently, he was politely rebutted and put back on the train to the capital.